Ms. Jacobs is an associate of the firm whose practice focuses on transactional law and civil litigation in a variety of business areas. Ms. Jacobs assists clients with their commercial needs and her transactional practice focuses on business formation, corporate document and agreement drafting, and various real estate transactions. 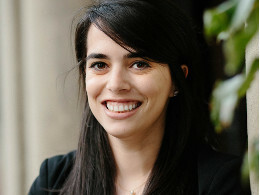 She also represents clients in all stages of civil litigation, including mediations and arbitrations, and has specific experience with public and private construction litigation and general business disputes. Prior to joining Strang Scott as an associate, Ms. Jacobs was a summer associate at the firm. Ms. Jacobs received her Juris Doctor from the Boston University School of Law. While in law school, she was a member and Note Editor of the American Journal of Law & Medicine, and received the Boston University School of Law Dean’s Award in Fiduciary Law. She received her Bachelor of Arts degree in Government & Politics and Psychology from the University of Maryland, College Park, where she graduated Phi Beta Kappa. Ms. Jacobs is admitted to practice in Massachusetts and the Federal District Court of Massachusetts. Assists with the formation and drafting of corporate documents for various start up business ventures. Assists with the review and negotiation of multiple and multi-layered commercial lease transactions for large biotech and pharmaceutical companies in Cambridge, Massachusetts. Represents several local restaurants and assists with corporate structuring and the review and negotiation of commercial lease transactions. Represents Boston-based property developer in the negotiation of several retail leases. Represented medical practice in the purchase, sale and construction of a new medical facility, including directly working with the lender to negotiate and organize the financing of the same. Assisted with the successful negotiation and closed business buyout on behalf of a growing restaurant chain. Second-chaired a successful mediation securing payment to a subcontractor alleging violation of the Competitive Bidding Statute and deficient design documents. Second-chaired multi-day arbitration on behalf of restaurant owners involved in build-out dispute with a general contractor. Successfully obtained mechanic’s lien dissolutions on behalf of clients for the removal of improperly obtained project liens. Experience with multi-state federal litigation motion practice.